More than 179 Million Fans Watched 100 Billion Minutes of College Football Games on ESPN’s TV Networks during the 2016 College Football Season; 15 Million Unique Devices Streamed ESPN Games - ESPN Press Room U.S.
More than 179,000,000 fans* watched more than 100 billion minutes of college football games on ESPN’s Nielsen-rated television networks** and ESPN games were streamed on 15,128,000 unique devices during the 2016 college football regular season, an increase in fans watching college football games on ESPN’s TV networks and unique devices streaming ESPN college football games from the 2015 college football regular season. The more than 15 million unique devices sets a new ESPN college football regular season record, surpassing last year’s then-record setting year by more than 17%. 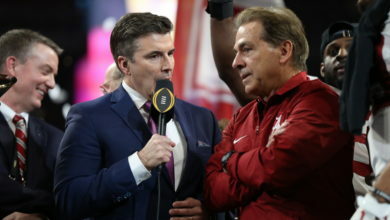 ABC’s Saturday Night Football was the most-watched college football franchise on any network this season, delivering an average total live audience of 6,087,000 viewers. Saturday Night Football’s TV audience (5,996,000 viewers) is up 10% from last season’s Saturday Night Football package and the streaming average audience is up 81% (91,000 viewers). SNF was also the highest-rated franchise across all networks in all key demos: males 18-34, 18-49, and 25-54 and persons 18-34, 18-49, and 25-54. Across all games and timeslots, ABC generated a total live audience of 5,175,000 viewers per game (44 games), up 4% per game from last season (42 games). The streaming average minute audience for games televised on ABC grew by 53% this season. Michigan at Ohio State on ABC (November 26) was by far the most-watched game of the season on any network, generating a total live audience of 17,120,000 viewers, setting both television and streaming records in the process. ABC’s TV audience (16,841,000 viewers) is the highest for a regular season college football noon ET kickoff across all networks on record and ABC’s second most-viewed game out of 793 game windows, dating back to 1991. ESPN’s stream had an average minute audience of 279,000 viewers with a total of 1,273,000 unique viewers watching 69,661,000 minutes, ESPN’s most-streamed regular season college football game ever in all three metrics. Double Overtime Thriller: Notre Dame at Texas (Sept. 4) delivered a total live audience of 11,139,000 average viewers, including an ABC TV audience of 10,945,000 viewers and a streaming average audience of 194,000 viewers, at the time, setting an ESPN regular season college football streaming record. Labor Day Night: Ole Miss vs. Florida State (Sept. 5) delivered a total live audience of 8,585,000 viewers, which included a then-record setting streaming average minute audience of 231,000 viewers. Combined with the Fighting Irish-Longhorn audience from the night prior, ESPN set new high water marks for most-streamed regular season games in consecutive nights – only to be broken once again by the Michigan-Ohio State game. Overall Streaming Record: This season’s opening week was the most-streamed college football regular season week ever with 3,874,000 unique devices. ESPN’s streaming average minute audience was up 31% per game compared to the last season for games on ESPN’s Nielsen-rated networks. Across all networks, ESPN streaming average minute audience was up 24%, unique devices up 19% and minutes up 24%, per game. Led by Michigan-Ohio State and along with the previously mentioned Rebels-Seminoles and Fighting Irish-Longhorn games, ESPN streamed its four most-watched regular season games ever this season and eight of the 10 most ever. Weekday Highs: In addition to the Rebels-Seminoles Monday Night record, ESPN set new streaming highs this season for Thursday (Appalachian State at Tennessee and Louisville at Houston) and Friday (Stanford at Washington) games. Won the Night: ABC and ESPN combined to be the most-watched network in prime time nine weeks of the college football season across all major demos (males 18-34, 18-49, and 25-54 and persons 18-34, 18-49, and 25-54).